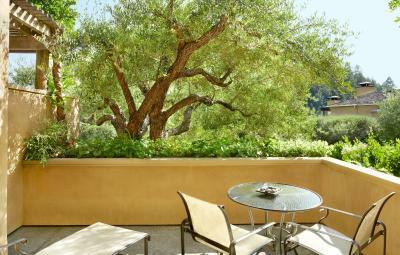 Lock in a great price for Auberge du Soleil, An Auberge Resort – rated 9.5 by recent guests! 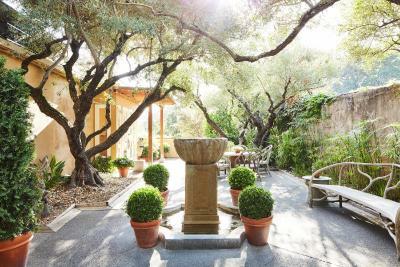 Auberge du Soleil is a magical and heavenly retreat for anyone wanting to luxuriate in their surroundings and just take a moment to appreciate the beauty that is the Napa Valley. 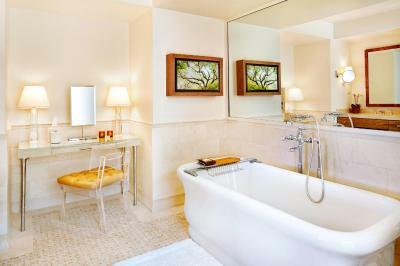 The property is stunning, the rooms and suites are decadent and the spa is a pampering oasis of luxury. The staff are second to none when it comes to superior service and the personal touch. We felt indulged and appreciated by everyone we met. The staff was extremely friendly. Jeff at the front desk was very courteous. The beds are comfortable, the grounds are beautiful, the many jacuzzis and the heated swimming pool. The choice of the latest Mercedes cars made available to hotel guests for up to 4 hours is also nice. Bed, patron, view, quiet, sculptures and the sculptures! Pool workout facility concierge got us into wineries! All as I can say is "Excellent" we will go back for a Week next time. Amazing room. Comfortable bed, commodities, bath. Excellent room with spacious bathroom which I care the most. Very good breakfast! A spectacular property. One of the finest in the world when it comes to comfort, ambience and staff friendliness. 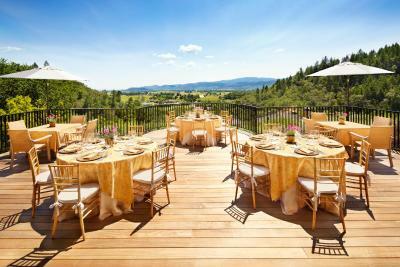 Auberge du Soleil, An Auberge Resort This rating is a reflection of how the property compares to the industry standard when it comes to price, facilities and services available. It's based on a self-evaluation by the property. Use this rating to help choose your stay! 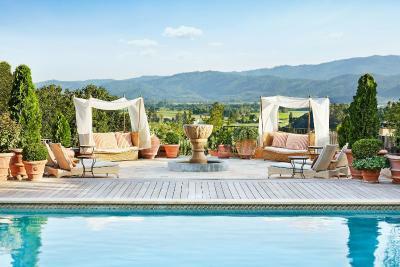 Nestled among a 33-acre olive grove, this luxury Napa Valley resort features an outdoor pool with cabanas, a relaxing health and wellness spa and a fine dining restaurant. 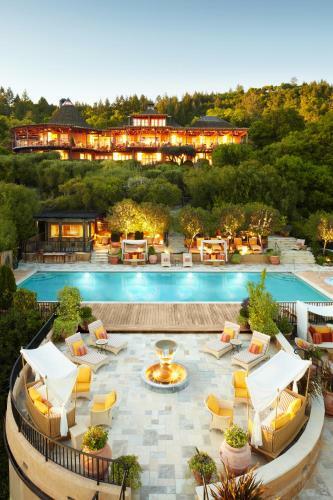 Guest accommodation at Auberge du Soleil, An Auberge Resort features a fireplace, free WiFi and balconies or patios with expansive views. 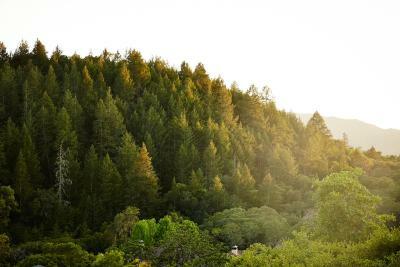 The property is a 25-minute drive from Central Napa. 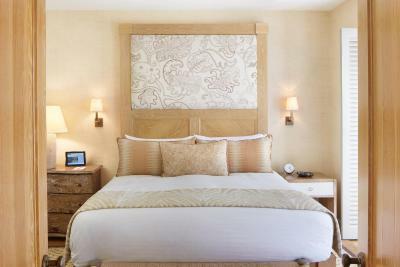 Italian linens, plush slippers and bathrobes are provided in all rooms or suites. An over-sized soaking tub with a separate walk-in shower, a double vanity and free spa toiletries are featured in the en suite bathroom of all rooms or suites. 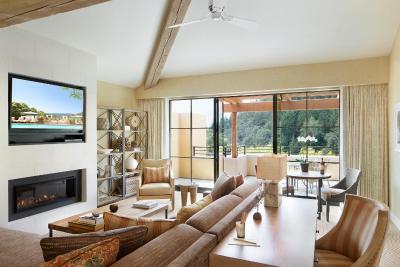 A separate living room and an additional LED TV are featured in select suites. 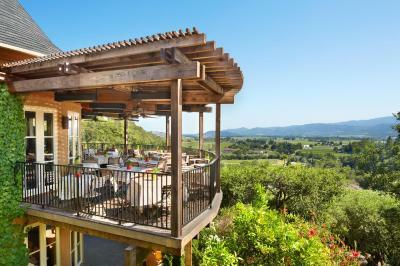 The acclaimed, Restaurant at Auberge du Soleil serves locally sourced California dishes with a dash of Mediterranean flavors. 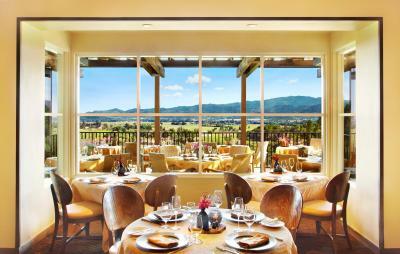 The restaurant has one of the most extensive wine cellars in the Napa Valley Region and serves breakfast, brunch, lunch and dinner. 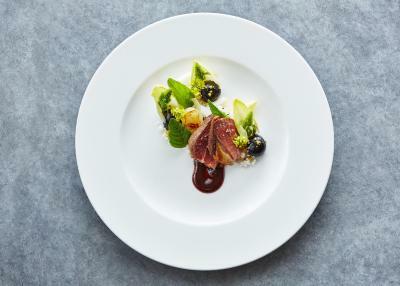 Featuring outdoor dining in a casual atmosphere, The Bistro & Bar offers an ever changing selection of wines by the glass and a terrace with panoramic views. 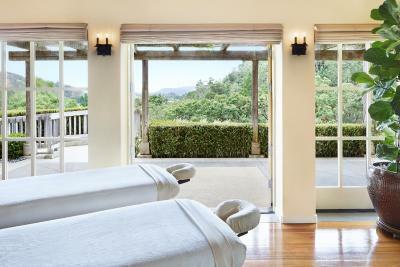 Auberge Napa Valley Spa offers massages, facials and a signature purification ritual. Guests can also attend complimentary fitness classes such as power yoga, boot camp and boxing at the spa. Lake Hennessey is a 5-minute drive away from this Mediterranean-inspired resort. 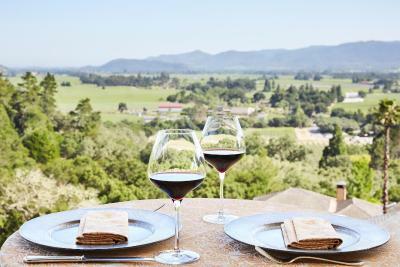 The town of Saint Helena is 10-minute drive from Auberge du Soleil, An Auberge Resort. This property also has one of the top-rated locations in Rutherford! Guests are happier about it compared to other properties in the area. 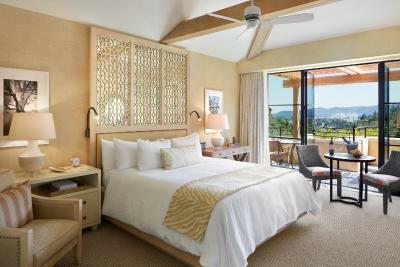 When would you like to stay at Auberge du Soleil, An Auberge Resort? 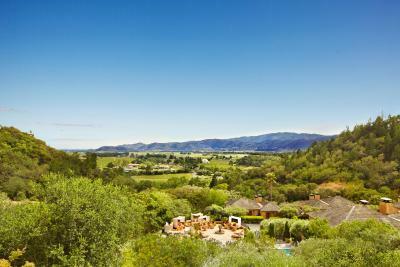 Featuring views of the Napa Valley hillside from a private terrace, this room provides free Wi-Fi, a fireplace, plush slippers and bathrobes. An over-sized soaking tub with a separate walk-in shower, a double vanity and free spa toiletries are featured in the private bathroom. Fresh fruit and free treats and beverages are offered daily. A free minibar is included. 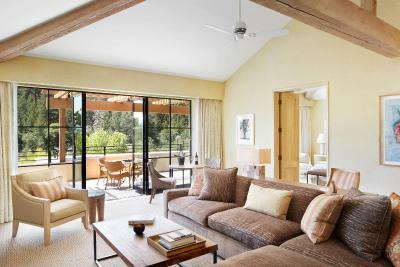 Featuring a separate living room and a private terrace with views of the Napa Valley hillside, this spacious suite provides free Wi-Fi. A fireplace, plush slippers and bathrobes are also provided. A second LED TV, an over-sized soaking tub with a separate walk-in shower, a double vanity and free spa toiletries are featured in the private bathroom. Fresh fruit and free treats and beverages are offered daily. A free minibar is included. 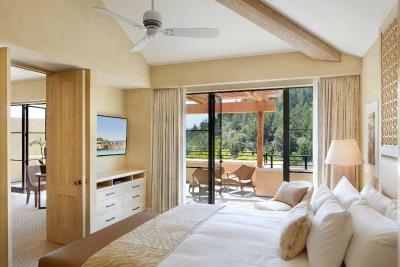 Featuring a separate living room and a private terrace with views of Napa Valley, this spacious suite offers free Wi-Fi. A fireplace, plush slippers and bathrobes are also provided. An over-sized soaking tub with a separate walk-in shower, a double vanity and free spa toiletries are featured in the private bathroom. Fresh fruit and free treats and beverages are offered daily. A free minibar is included. Featuring a furnished private terrace with garden views, this Deluxe King Room comes with free WiFi, a fireplace, plush slippers and bathrobes. An over-sized soaking tub with a separate walk-in shower, a double vanity and free spa toiletries are featured in the private bathroom. The bathroom features a skylight overhead and heated limestone floors, and 22" plasma televisions aligned over a freestanding sculptural bathtub. Fresh fruit, free treats, and beverages are offered daily. A free mini bar is included. 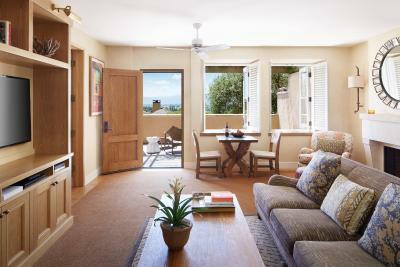 Featuring a furnished private terrace with views of the hillsides and olive groves of Napa Valley, this Deluxe King Room comes with free WiFi, a fireplace, plush slippers and bathrobes. An over-sized soaking tub with a separate walk-in shower, a double vanity and free spa toiletries are featured in the private bathroom. The bathroom features a skylight overhead and heated limestone floors, and 22" plasma televisions aligned over a freestanding sculptural bathtub. Fresh fruit, free treats, and beverages are offered daily. A free mini bar is included. 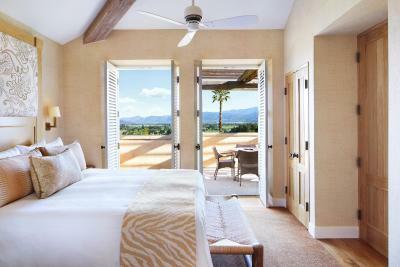 Featuring a furnished private terrace with panoramic views of Napa Valley, this Deluxe King Room comes with free WiFi, a fireplace, plush slippers and bathrobes. An over-sized soaking tub with a separate walk-in shower, a double vanity and free spa toiletries are featured in the private bathroom. The bathroom features a skylight overhead and heated limestone floors, and 22" plasma televisions aligned over a freestanding sculptural bathtub. Fresh fruit, free treats, and beverages are offered daily. A free mini bar is included. 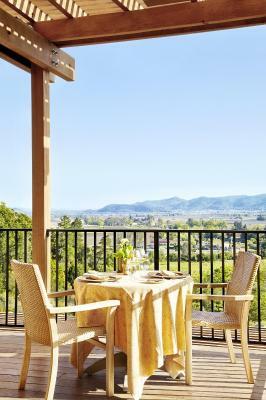 Featuring a furnished private terrace with panoramic views of Napa Valley, this Deluxe Queen Room comes with free WiFi, a fireplace, plush slippers and bathrobes. An over-sized soaking tub with a separate walk-in shower, a double vanity and free spa toiletries are featured in the private bathroom. The bathroom features a skylight overhead and heated limestone floors, and 22" plasma televisions aligned over a freestanding sculptural bathtub. Fresh fruit, free treats, and beverages are offered daily. A free mini bar is included. Featuring a furnished private garden complete with a dining area and outdoor tub and shower, this Deluxe King Room comes with free WiFi, a fireplace, plush slippers and bathrobes. An over-sized soaking tub with a separate walk-in shower, a double vanity and free spa toiletries are featured in the private bathroom. 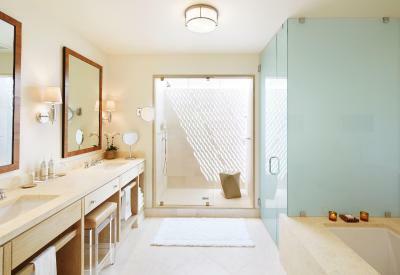 The bathroom features a skylight overhead and heated limestone floors, and 22" plasma televisions aligned over a freestanding sculptural bathtub. Fresh fruit, free treats, and beverages are offered daily. A free mini bar is included. 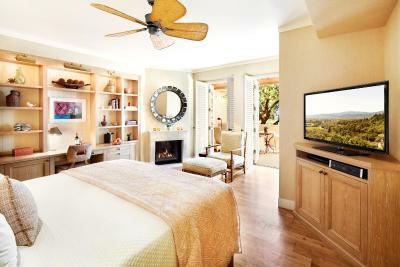 Featuring an over-sized private terrace with views of the surrounding Napa Valley hillsides and olive grove, this Deluxe King Suite comes with free WiFi, a fireplace, plush slippers and bathrobes. An over-sized soaking tub with a separate walk-in shower, a double vanity and free spa toiletries are featured in the private bathroom. The bathroom features a skylight overhead and heated limestone floors, and 22" plasma televisions aligned over a freestanding sculptural bathtub. Fresh fruit, free treats, and beverages are offered daily. A free mini bar is included. Featuring an over-sized private terrace with views of Napa Valley, the Deluxe King Suite comes with free WiFi, a fireplace, plush slippers and bathrobes. An over-sized soaking tub with a separate walk-in shower, a double vanity and free spa toiletries are featured in the private bathroom. The bathroom features a skylight overhead and heated limestone floors, and 22" plasma televisions aligned over a freestanding sculptural bathtub. Fresh fruit, free treats, and beverages are offered daily. A free mini bar is included. 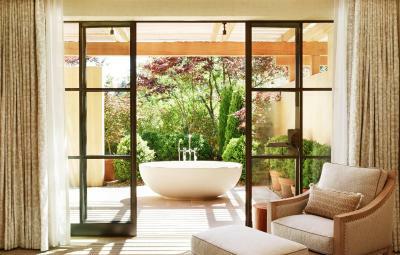 Featuring a private garden with an outdoor freestanding sculptural bathtub and outdoor rain shower, the Deluxe King Suite comes with views of Napa Valley. Other amenities include free WiFi, a fireplace, plush slippers and bathrobes. The suite has a separate half bathroom. Fresh fruit, free treats, and beverages are offered daily. A free mini bar is included. This Premium One-Bedroom Suite comes with a private fitness studio. 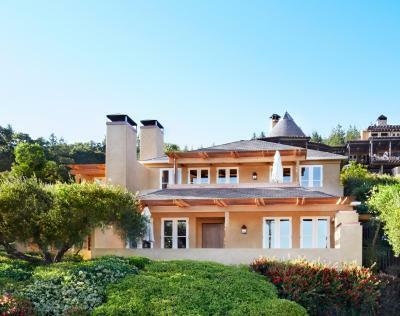 Featuring an outdoor sculptural tub and outdoor shower on the terrace, it is a free-standing house with views of Napa Valley. 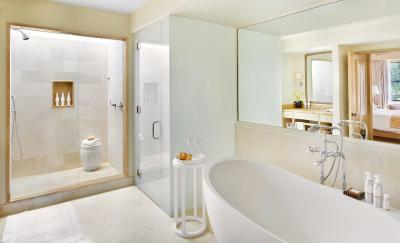 The master bedroom features a sculptural tub, steam shower for two, double sink, dressing vanity and walk-in closet. 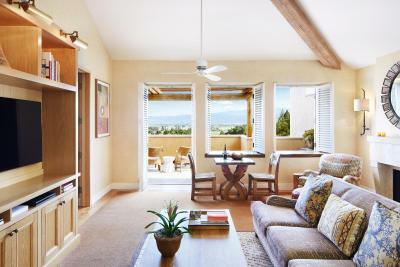 The living room features a fireplace, sitting area, dining alcove, built-in bar, refrigerator and espresso machine. 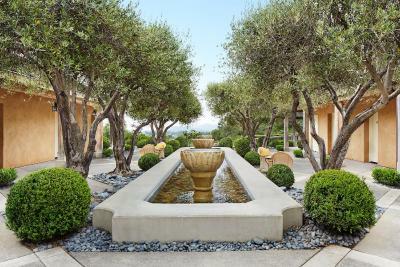 Featuring an outdoor sculptural tub and outdoor shower on the terrace, this Two-Bedroom King Suite is a free-standing house with views of Napa Valley. 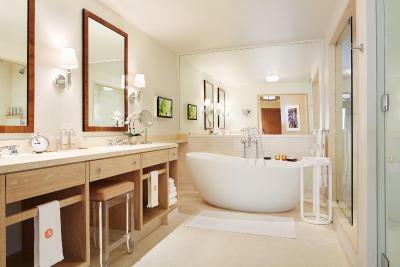 The master bedroom features a sculptural tub, steam shower for two, double sink, dressing vanity and walk-in closet. 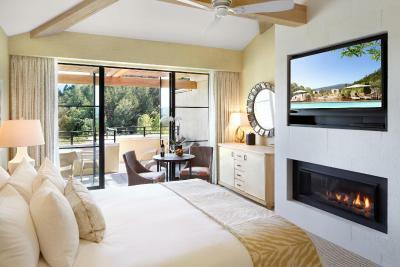 The living room features a fireplace, sitting area, dining alcove, built-in bar, refrigerator and espresso machine. 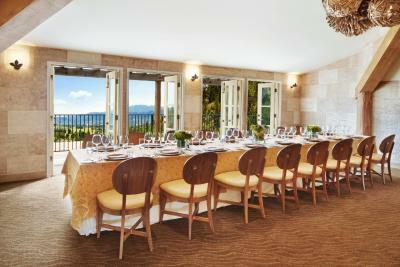 House Rules Auberge du Soleil, An Auberge Resort takes special requests – add in the next step! One additional child or adult is charged USD 125 per night when using existing beds. 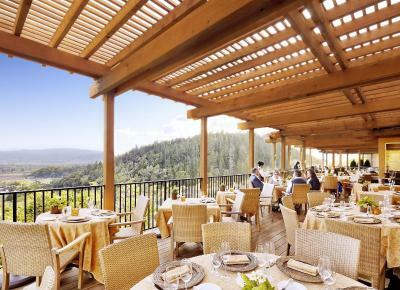 Auberge du Soleil, An Auberge Resort accepts these cards and reserves the right to temporarily hold an amount prior to arrival. Please note: The property will charge a fee for cancelations made before 14 days of arrival. A prepayment of 100% of the total reservation will be charged at the time of booking. The extra person charge in a suite is subject to be taxed. The total reservation charge plus all local and state taxes will be charged by the property. Please note the hotel will be undergoing renovations. The work will be limited to select rooms, including walkways and landscaping adjoining these guest room area through April 30. Additional work will also take place at the spa locker room and fitness center bathroom through mid April. Please contact the property for details. Many things were reformulating, including the swimming pool. So we couldn’t use it. The fact that we had to leave was so sad!! The construction of two additional buildings. It was noisy by the swimming pool area. Jeff at the front desk was very considerate when we shared upon check out. .............the restaurant. 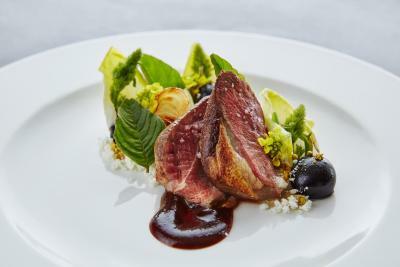 The restaurant has 1 Michelin Star which from an European point of view it does NOT deserve. The food is tasty, no doubt, but the menu is boring, our food was served luke warm and the price point is beyond acceptability. With other words: This restaurant is highly overrated. The wine list is extensive. 8 out of 10 bottles are over $ 600.00 which makes no sense in my opinion. Some Michelin tester must have been irritated by that, when they gave the Star to Auberge Du Soleil.